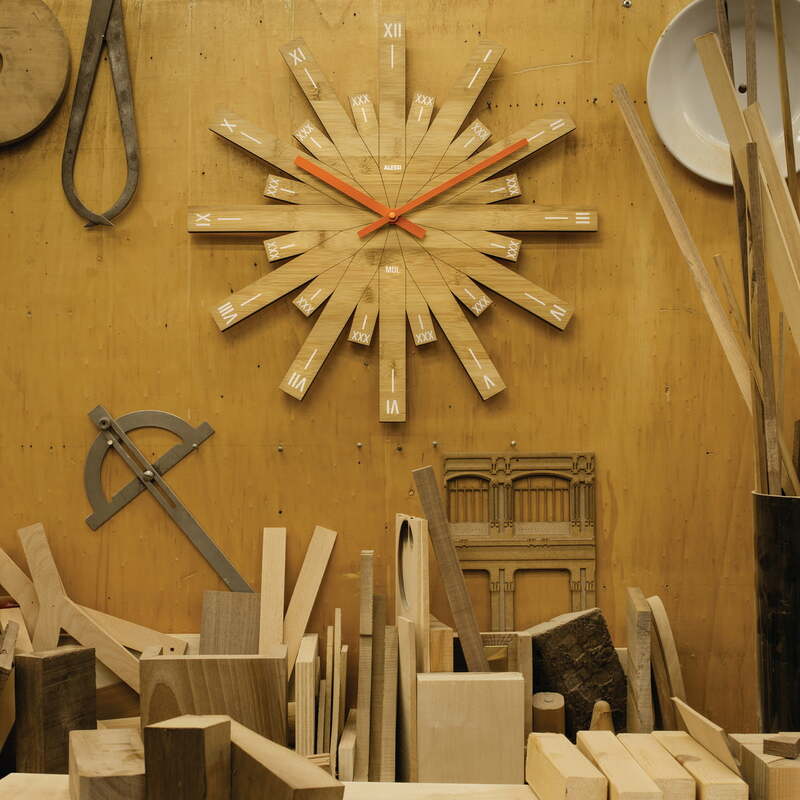 The Raggiante wall clock by Alessi is made from bamboo wood. "Raggiante" means radiant, referring to the twelve long sunrays that represent the hours. Twelve smaller rectangular rays can be seen between the longer rays. The hands are a bright orange color and complement the image of the Sun perfectly. The design of the wall clock by Michele De Lucchi was inspired by the fact that the Sun indicates the time of day. The day begins when the sun rises and without its light the subdivision of morning, noon and evening would be obsolete. Raggiante is a clock that shines on the wall, making it easy to read the time - whether you are eating, sitting on the sofa or entering the house. 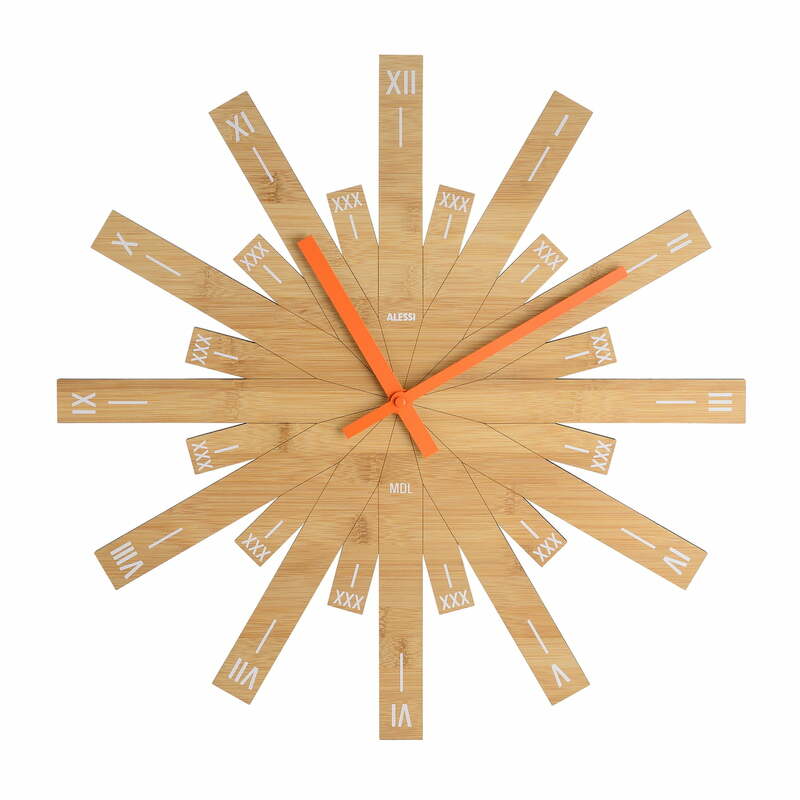 The Raggiante wall clock by Alessi is made from bamboo wood. "Raggiante" means radiant, referring to the twelve long sunrays that represent the hours. Twelve smaller rectangular rays can be seen between the longer rays. The hands are a bright orange color and complement the image of the Sun perfectly. The design of the wall clock by Michele De Lucchi was inspired by the fact that the Sun indicates the time of day. The day begins when the sun rises. Without its light the subdivision of morning, noon and evening would be obsolete.